I am well aware that some may consider pumpkin to be a little trite by this time. Starbucks churned out its Pumpkin Spice Latte in the lead-up to Thanksgiving, restaurants proudly presented their own interpretations of pumpkin soup (sprinkled with caramelized bacon, topped with toasted sweetcorn, swirled with cream, and infused with the spices of Thailand), and every bakery happily announced the arrival of a pumpkin chocolate chip muffin. Pumpkin even managed to make its way to Christmas via pumpkin truffles in my stocking, but is January really too far to take it? Once you taste these little cookies I promise you won't think so. In fact, I think they would be the perfect antidote to the blues that are slowly settling in here at St Andrews. It's beginning to hit everyone just how imminent exams are. Throughout the whole first semester and during the holidays, we all had a vague notion of exams. They were to come at some time 'in the future', but we didn't really need to worry about them. We would deal with them when the time came. Sadly, the time has come. The libraries are filling up, and study sessions are beginning. Russian flashcards are being made, anatomical diagrams are being pored over, and mathematical formulas are being memorized frantically. Everyone is entering the zone, or trying to at least, but it's always nice to have a little break now and again to sip a warm cup of tea and nibble on a little something sweet. I had these at home and couldn't stop myself from going back to the bell jar where we keep treats every hour or so. They fueled me in my work, and helped motivate me. A bit of studying was rewarded with a cookie! They are pillowy and soft, almost like a whoopie pie. 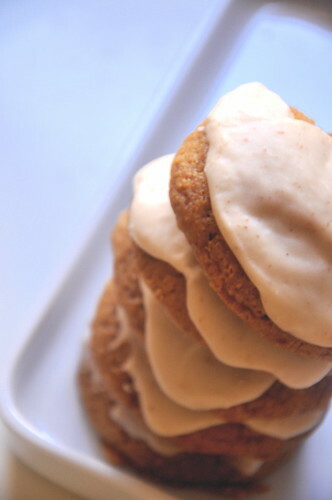 However, they are much more flavorful than a traditional whoopie pie. 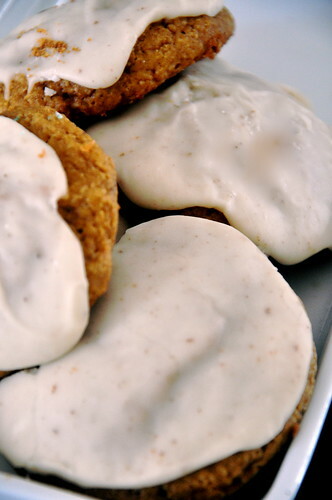 The pumpkin flavor really sings when brought out by the cinnamon, allspice, and ginger. They are just moist enough and still feel substantial, despite their airiness. 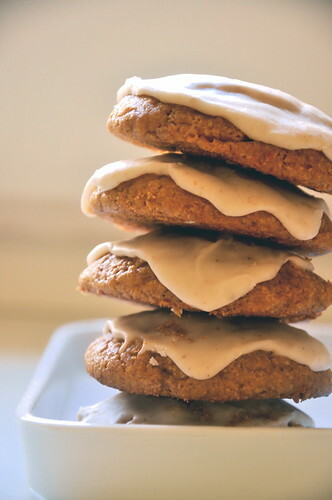 All of those things are great, but the brown butter icing really makes these cookies. It's nutty and warm and just so delicious. The icing is perfectly smooth and doesn't leave the roof of your mouth feeling tacky like some frostings do. They are so quick and easy that you could probably even whip up a batch during a study break. Preheat the oven to 375 degrees. Line baking sheets with parchment paper. Whisk together the flour, baking powder, baking soda, salt, cinnamon, ginger, allspice, and nutmeg. Cream the butter and brown sugar together until light and fluffy. Add the eggs one at a time. Add the pumpkin puree and vanilla extract and beat until smooth and fully incorporated. Drop heaping tablespoons of the dough onto the prepared baking sheets. Bake for 12 minutes, rotating the sheets halfway through. Put on a wire rack to cool. Melt the butter in a small saucepan until it is dark amber in color and is aromatic. Whisk the butter, powdered sugar, evaporated milk, and vanilla together in a large bowl. 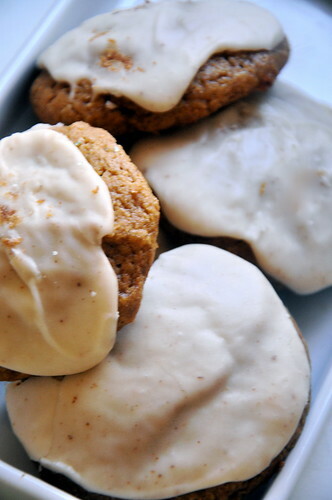 Spread a generous dollop of icing on each cookie.